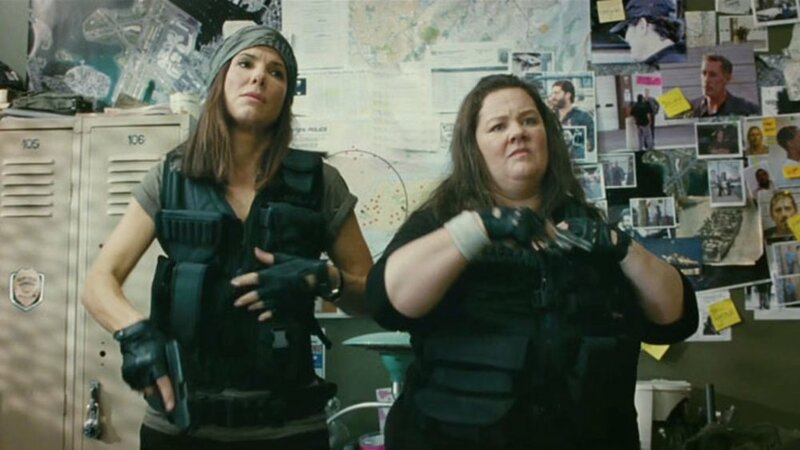 Ever wonder what a buddy cop movie would be like if you replaced the buddy cops with female buddy cops? It's about as ridiculous as one would imagine, although with generally less levels of action and over-the-top explosions. Can the uptight FBI agent overcome her better-than-thou attitude and work together with the rough around the edges and relatively hostile boston beat cop? Agent Ashburn (Sandra Bullock) is looking to get a promotion. She's cracked loads of cases and proven numerous times that she has an eye for details - there's only one real problem. She has a bit of an issue with other people. She rides high on her mighty horse of know-it-all, and it causes a bit of dislike and tension between her and her co-workers (meaning in short that nobody likes her because she's a bit of a jerk). A case opens up in Boston, and her boss sends her down to try and bust a big drug lord who's got an MO of cutting people up in nasty ways. Detective Mullins (Melissa McCarthy) is a person who also doesn't quite get along with a lot of people. She has a rough and tumble way of dealing things - chasing people down in cars and forcibly ripping perps from their cars. She's coming in with a perp she's just picked up when a lady in a suit steals her parking space. Just so happens that this lady was Ashburn, and needless to say they aren't getting off on the right foot with each other. The plot is simple: two cop-types trying to catch a crook and bring them to justice. Some hooks are thrown in when the dynamic duo runs across another branch of the law, some family issues crop up, and overall things start getting pretty tense. To keep this from getting too heavy, the interaction between the two is normally pretty goofy- until of course the two finally start getting along as time passes, and things end up feeling more like a generic buddy cop movie. There's also some blatant cracks at things like sexism, judging books by their covers, doing the right thing, and of course why you shouldn't treat everyone like they are below you. As far as jokes go there's a line that runs between funny and not, and for me (because everyone's humor is different) the movie drunkenly stumbles back and forth across that line. At moments, I'm laughing out loud in bursts, and other times I want to hang my head in shame at it's attempted jokes (not the real pun-ny one, that I laughed at). The interactions between the two cops attempts to (noticeably) make things more funny then they sometimes are with most of Mullins humor coming from her being so rough around the edges and wolverine-grade angry, and Ashburn tending to just be awkward more than funny. I'd put forth a wager that you will most likely laugh at least once during the movie, but how much more than that is completely dependant on your sense of humor and your state of mind. Action exists, but it's rather sparse compared to the normal buddy cop movie. What does exist seems to focus more on the comedy side then action still, with the action taking frequent breaks to set up or try and deliver jokes, and at times it feels more like a chick-flick without the major romance plots then it does a legitimate cop movie (such as the somewhat lengthy bar scene). When it's on, it's on and things are really entertaining, but when it's off it can at time drag slightly - not enough to really be that bothersome. Audio is good here - even though I'm not particularly a fan of the music used (it works, it fits the premise, it's just not my particular genre). Language is harsh the entire thing, so if you have a problem with swearing then you should stay away (I would think that the main reason for it's R rating is the language). Delivery is well done, helping with some of the jokes, and the overall performances between the actors on screen is the largest helping of comedy in the movie. When the albino character comes on screen, for example, we get Mullins yelling "What is that?" in a much more colorful manner. Interactions between Ashburn and a police drug-sniffing dog is also rather amusing by the end. Overall, it's certainly not the funniest movie I've ever seen, but it's worth a watch. Some of the stumbling points feel much as though the movie is just trying too hard, but when it happens to be in the zone it does quite well at entertaining. Moments crop up as being stand out, and the plot holds together enough that it doesn't lessen the movie experience even though it's not particularly something that you expect to win any awards. The movie tends to deal a bit with extremes, so be ready for a little bit of overly stereotyped nerdy awkward and rough-edged angry cop.